The Blog of Jared Kirk: What about the dinosaurs?? But now that we've gotten that out of the way, on to a blog post that I've spent a great deal of time thinking through. I thought about it while driving, running, and praying. I talked to Pastor Todd about it, and Pastor Mark, and Pastor Robbie. And what follows is what I've got. The best response to a difficult question certainly depends on 1.) who asked the question and 2.) who else is listening to your answer. Perhaps everyone in your group is a Christian, but very likely, someone is not. In Scripture there are secondary issues and their are primary issues. It makes no sense to get caught up in the secondary issues until everyone is in agreement about the primary issues. So here is how I would respond to my entire group since I normally assume that someone present is disconnected. "I wouldn't worry too much about that kind of thing until you have decided on the bigger issues in the Bible. What you believe about the age of the earth doesn't determine your relationship with God. But what you believe about Jesus dying for your sins and raising bodily from the dead does. If you don't believe that Jesus rose from the dead then who cares what the Bible says about creation. But if Jesus is the Lord of the world, raised bodily from the dead, then you have to deal with what he teaches about everything, including creation." To break down the game-tape of what just happened. I re-framed the issue at hand as peripheral and made a beeline to the resurrection. Why? Because it doesn't matter? No. Because it doesn't matter as much as Jesus. The point is that what another Christian believes about creation is not an excuse for breaking fellowship with them, but what another Christian believes about whether Jesus actually died for our sins and is raised from the dead is. In the office of Next Level you could poll all 7 pastors (5 of whom went to Bible college or seminary) and probably get 7 slightly different answers to the question "How did Creation actually go down?" But what normally happens at this point in the conversation is that someone pushes you, unhelpfully, to answer the question. I usually preface my answer with, "Well I'm not sure, I wasn't there. 70% of the time I think it is ___________. And the other 30% of the time I think it is __________." Saying "The Bible says so, so I believe it!" is a valid response, but it is incredibly unhelpful to people who do not share your level of faith. So in order to actually be helpful to you, O reader, I have categorized common responses into three categories: Valid Answers, Invalid Answers, Grey Answers. These category labels apply from the perspective from people who believe that the Bible is the inspired Word of God. So if you don't believe that right now, forget the labels and enjoy the free information. In this view, God created the world in seven literal days approximately 6,000 to 10,000 years ago. God created the world as having age already. 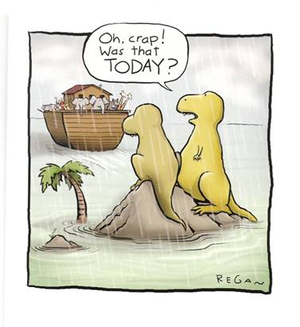 Dinosaurs are created by God and left off the ark. Pastor Robbie likes to say, "God said two of every animal on the ark, not two of every monster. If I'm Noah, no way I'm bringing one of those on my ark." Pros: God can do anything, including this. Cons: The first chapter of Genesis does not read like historical narrative (compare it to Chronicles). There is day and night before there is a Sun or Moon. Doesn't account for the fossil record. There is a discrepancy in the order of creation between Genesis 1 and 2. In this view, there is a gap of millions or billions of years between the happenings of Genesis 1:1 and 1:2. So, "In the beginning God created the heavens and the earth (pause for a billion years). Now the earth was formless and void..." Dinosaurs die in Noah's worldwide flood. Pros: Accounts for the apparent age of the earth. Cons: Text isn't very clear on the gap. Doesn't account for the fossil record very well. Here the genre of Genesis 1 is seen to be a song or poem which is a mature reflection on God's creation. So God creates the universe through natural means over however many years and then at a certain time the historical narrative of Genesis 2 begins when God makes a garden, and a man, and animals, etc. Also, accounts for the change in chronology between Genesis 1 and 2 where plants are made first then man, followed by man made and then plants. Pros: Accounts for fossil record and apparent age of earth. Cons: When death enters the world it refers to the death of man, not death in general. From studying the origin myths of many ancient near eastern religions some people have concluded that Genesis 1 and 2 are origin myths adapted from other religions. Marshaled in support of this argument is the theory of evolution, the age of the earth, and the fossil record. While the scripture is not clear on the genre of Genesis 1 it is clear in its appraisal of Adam as an actual human being. This is seen most clearly when Jesus and Adam are put in parallel by Paul. In general, this view is based on an Western Post-Enlightenment presupposition that miracles cannot happen and that God, if he exists, does not intervene in the cosmos. This is incompatible with the view of God held by Jesus himself. Not to mention Jesus rising from the dead. Francis Collins pioneered this theory which was a breakthrough in his work concerning genetic variability. The sheer complexity of life at the bio-molecular level, of which Darwin himself was unaware, tends against a theory of evolution from totally random mutations. He advocates a form of guided evolution in which God created the world through natural means. Then life developed through guided evolution including hominid species until a suitable container was produced (read: a suitable body) for God to put his image in. This leaves Genesis 2 in flux. There was a garden and a literal Adam, but other parts of the chapter wouldn't seem to make sense. That is why I categorized it as Grey. It is important to remind people that science is good for what science is good for. In other words, while science makes claims from a neutral perspective about things which are observable, repeatable, and measurable then we are all on solid ground. But the worldview of many secular scientists depends on maintaining that the Bible is inaccurate. This is why scientists are constantly making claims that goes beyond the reach of science. At the end of the day it is important to remember that because God himself is unchanging and creative we can discover his universe that is filled with creative laws and truths. We don't have anything to fear from science that is done well. But we also live under the authority of scripture because that is the way laid out by Jesus. They go together, they really do. Great job on a tough subject, Jared! Being a trained scientist, my view is that science & faith are not mutually exclusive at all. If God our creator made everything, including the measurable things we categorize as "science," then how beautiful and complex is his artwork! BTW - please see my recent post on FB about "Neutrinos" mis-behaving... God also has a sense of humor! Awesome Jared! Enjoyed reading this...thanks for giving us some info in case we are hit with tough questions like this!! Very nicely constructed man. Great read. bEST THINK i READ ALL WEEK! That's awesome Mom. I love you.